Ushering in the Christmas season, the “Frozen” gang appeared tonight for the first time in front of Cinderella Castle to illuminate its spires with an icy flair. 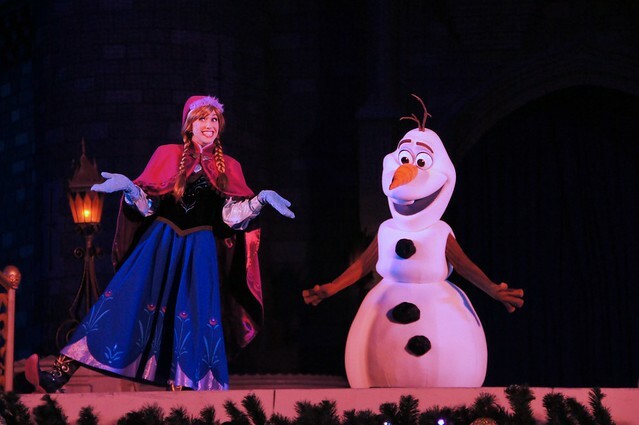 Anna, Elsa, and Kristoff took the stage to begin the new show, quickly welcoming Olaf into the character mix for the first time ever in a Disney theme park. 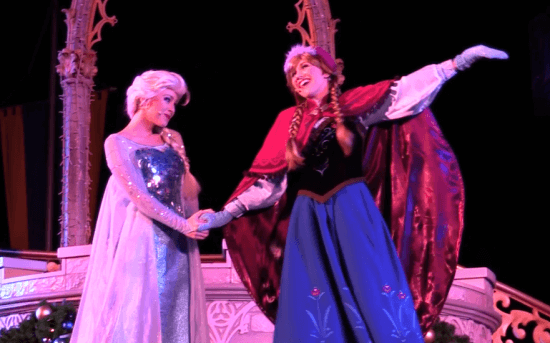 They note that it isn’t their Arendelle castle – they’re just “visiting.” But with encouragement from the crowd, Elsa decides it’s okay to use her powers to put on a little performance. There’s no singalong of “Let It Go” in this stage show, though strains of the song are heard mixed in with some new holiday music. 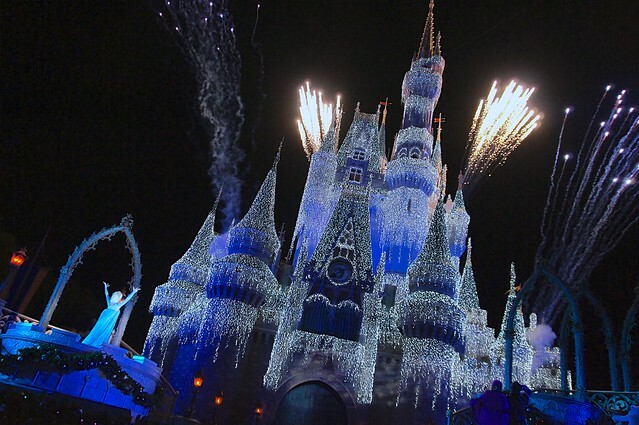 Elsa swirls her magic via projections on Cinderella Castle before its thousands of twinkling lights brighten along with a few pyrotechnic blasts. 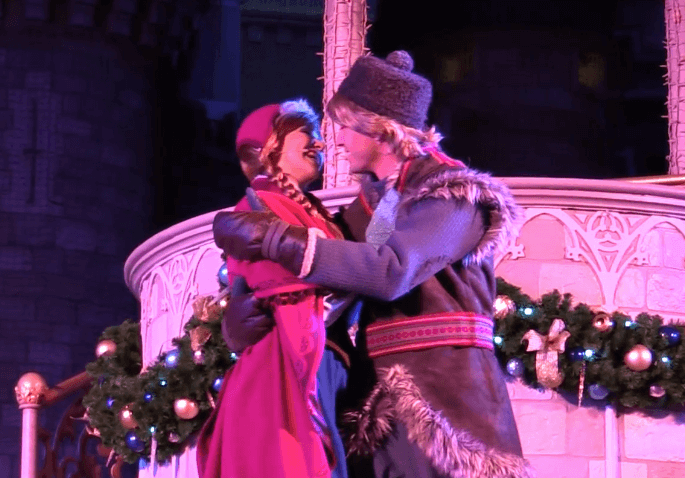 Anna and Kristoff share a few choice moments, as Anna almost refers to him as her boyfriend but stops short, simply calling him her Kristoff. But they definitely stay close throughout the performance. 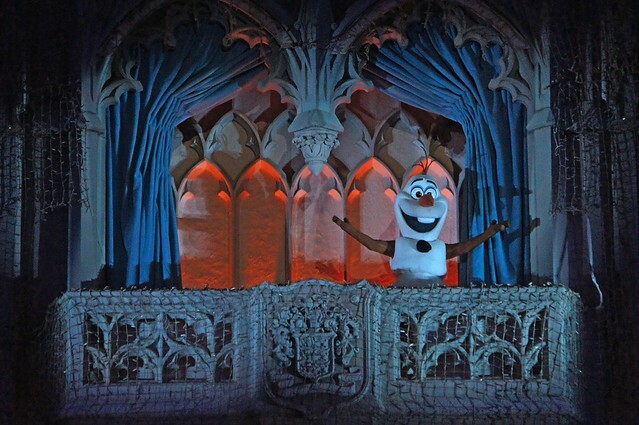 Olaf is certainly larger than he appears in the movie, a point which is poked fun at when he notes how small the audience is from his initial vantage point up on the castle. Disney clearly knows this costumed character isn’t exactly the right size, but it works anyway. 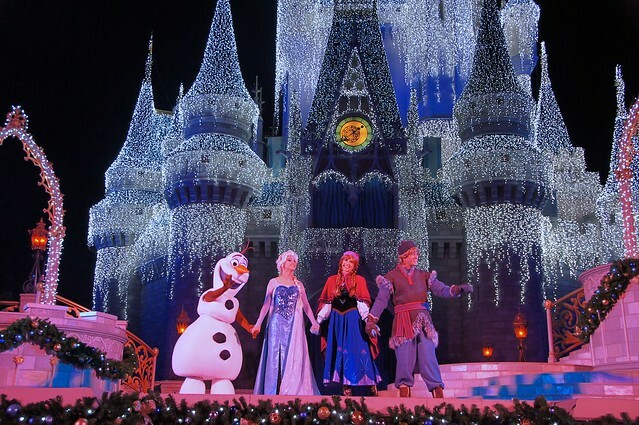 A Frozen Holiday Wish has just the right mix of “Frozen” familiarity and holiday spectacle, without feeling too in-your-face about either one, especially when debuting so early in November, nearly two months before Christmas day. 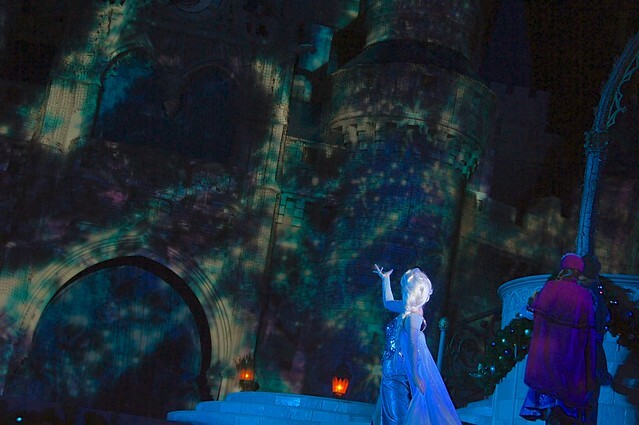 The show will continue to be performed twice nightly throughout the rest of the year. I love that these get shared for those of us unable to see it in person. So, is this part of the Christmas Party? Or, is it taking place of Wishes or something else? Or just a new addition? plot twist: Elsa accidentally shoots Ana with ice again while trying to ice the castle and she falls over and castle doesn’t shine until Cinderella comes and earns her right again and completes the show with the original Cinderella castle show. Alex, this is the lighting ceremony that happens every night. Normally it happens before Wishes and it’s for everyone that’s at the park. It is not a Christmas party only event. It used to be a show that had Mickey, Minnie, Donald, Goofy, Cinderella, Prince Charming, and the Fairy Godmother as the cast and in my opinion the Frozen isn’t as good as the original show. 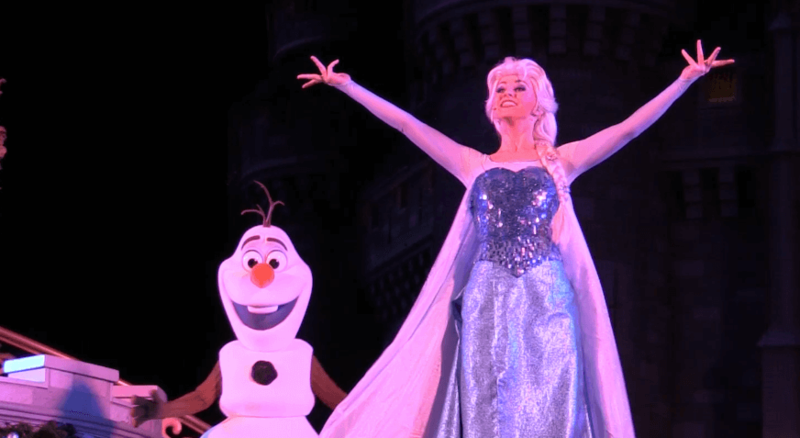 Elsa is performing as she did in the movie. It’s called being true to character. Oh, and it was even better without another Let it go sing along. Best comment EVER! Love it! Fun. but I enjoyed the Show with Mickey and the gang better. 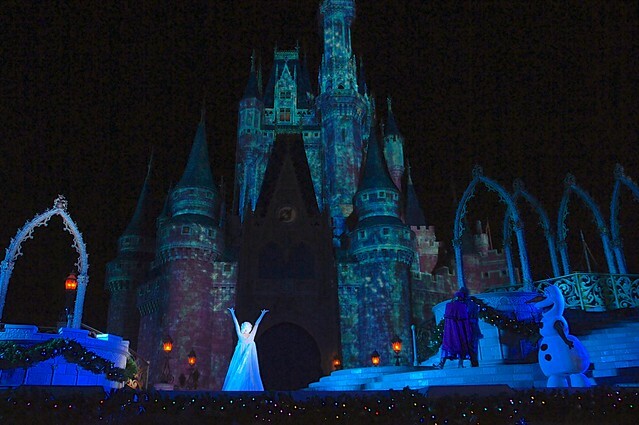 And instead of asking the crowd if Elsa should decorate the castle, they should have asked Cinderella. 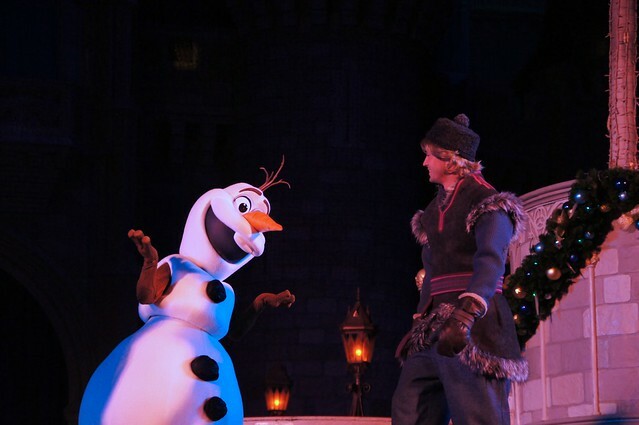 Elsa was the obvious choice to turn the castle to ice. She asked permission to do it and received it. All s good. I happened to see this 3 days ago on Nov. 9, 2014, not having any idea that Disney World did this. It was stunning beyond words, almost mesmerizing. The castle in ice changed colors/hues a few times during the night, being blue, pink and I saw a turquoise green once. 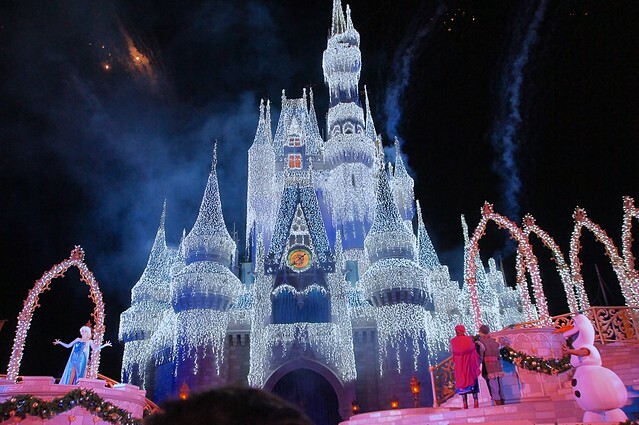 Even if you have been to WDW before several times, it is worth going to WDW again to see this amazing spectacle. A park staffer told me that it is only on ice like this for about 2 months, ending sometime the first week of January each year. It is also interesting that the castle is becoming part of shows now, and not just this quiet sentinel standing there. sadly I miss the old show or think maybe they should have incorporated Mickey in there or even Cinderella since it is her castle. One more thing needed is a way to have a stroller area, you just can’t move if you’re up close.